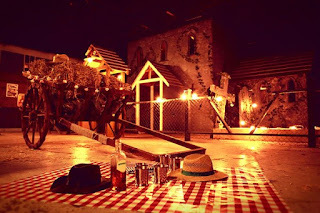 Django Bango is a 2 month Wild West themed pop-up in Whitechapel, with a saloon, western-style street food, games, live music and more. Open on Friday and Saturday nights only from 19th February to 2nd April, it also has private rooms to hire, and an amazing looking decor. You've really got to go! "Made entirely of wood, Django Bango is a bona fide buckaroo town with sprawling multi-storey buildings and dusty streets; complete with a Saloon Bar, creaky church confessional and the risk of jail time for any outlaws. Folks are free to roam the land, feast on American street food, or drop in to the general stores to pick up their cowboy clobber. Drinking and dancing in the streets is favoured in this town, but guests can also curl up on bales of hay in one of the many softly lit country houses. The large Saloon Bar is stocked with reasonably priced beer and liquor and features the whistle-wetting signature cocktail ‘Badlands Brew’, to cowboy you up for action packed games such as the spitting platoon or gun range; all to the sweet sounds of live country music. The town suits gangs of any size; large rowdy clans can reserve rooms or even entire houses, or couples can cosy up in one of the smaller rooms with views of Django Bango’s lively streets below. Early birds can snap up the rooms with views overlooking the bustling main square where they can sit back and watch the mayhem unfold. Django Bango - where Hipster East meets Wild West - is based in East London’s Brick Lane area, two minutes walk south of Whitechapel tube. Amusingly-named Django Bango will bring a flavour of the Wild West to London’s East End between February and April, with the promise of street food, country music, liquor and lassos — as well as a pretty impressive multi-storey set designed by immersive experience company - Apocalypse Events"